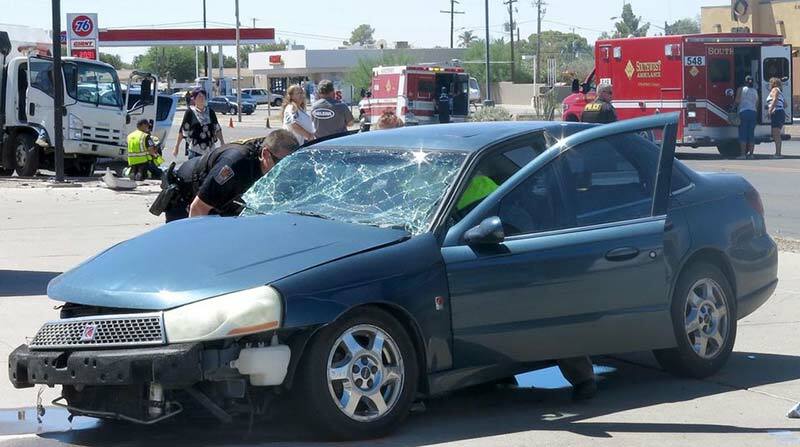 Coolidge, Arizona—Neeley Struck, age 22, was injured when his 2004 Saturn Sedan collided with a 2004 Nissan Armada Monday morning at the intersection of Arizona Boulevard and Walton Avenue, according to Coolidge Police Officer David Gross. Just prior to the collision, Mr. Struck had stopped at the stop sign at Caroline Street and Arizona Boulevard. As he proceeded to cross four lanes of traffic, his vehicle collided with the Nissan that was traveling north on Arizona Boulevard. Following this first collision, the Nissan then struck a 2013 Isuzu work truck at the intersection of Arizona Boulevard and Walton Avenue. The second collision caused the Saturn to jump the curb and come to rest in a parking lot. Flying debris damaged another vehicle in the parking lot. Mr. Struck was airlifted to Maricopa Medical Center with injuries to his right femur, abdomen and head. Three occupants of the other vehicles involved were taken to Florence Anthem Hospital with neck and head injuries. They were identified as Tadeo Bravo, age 24, Fernando Lopez, age 32 and Rodolfo Aeuerre, age 42. No citations were issued at the scene. We wish all those involved swift and complete recoveries.